This weekend was big for grand openings. First, there was the American Girl Store at Tysons Corner Center. 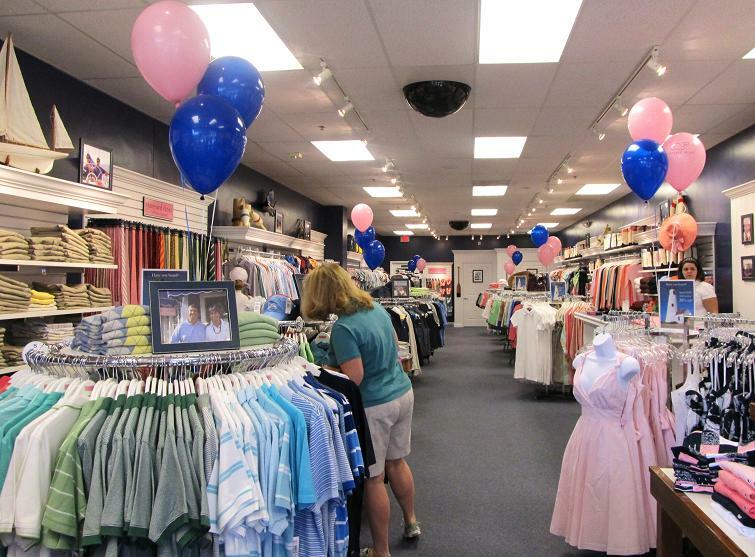 The Vineyard Vines outlet also opened its doors at Leesburg Corner. Natalia immediately recognized the familiar whale logo from a distance of about 50 feet. Good eyes, my girl! Many outlet stores sell items that are made especially for outlet stores. 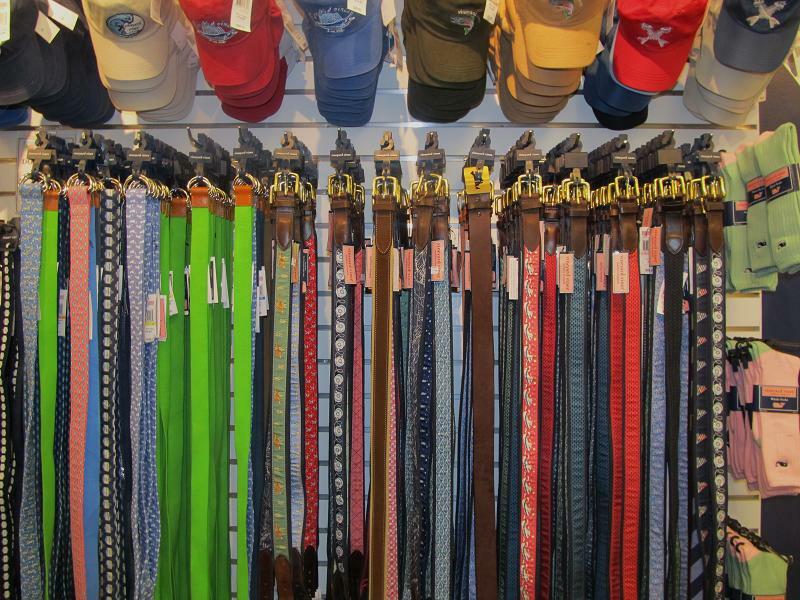 At Vineyard Vines, all of the items are from current or past seasons and are exactly the same as what can be found at retail stores or online. 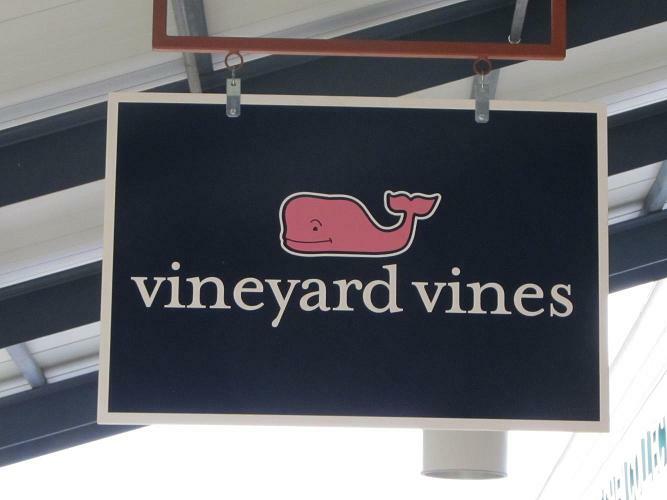 In the front of the store, Vineyard Vines is divided in half. One side has men’s clothing and accessories. 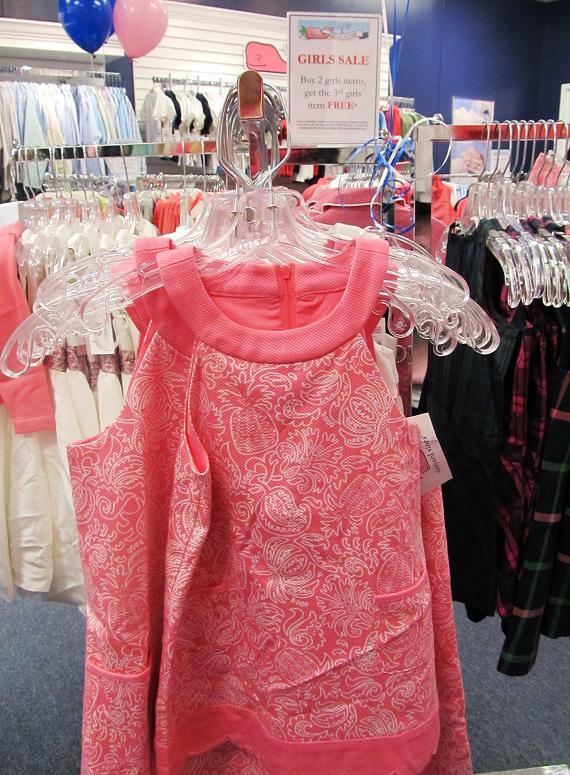 The other side is devoted to women’s pants, skirts, shorts, dresses, and more. 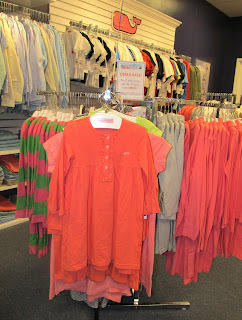 I was surprised to find a large selection of boys and girls clothing in the back part of the store. This season, one of my favorite Vineyard Vines looks is the pineapple patch short, skirt, and skort in adorably preppy pink, white, and blue. You can find these items in stores now, so I was thrilled to find the shorts…with a price tag of $35! My mother always says that a sign of good quality is that the plaids, prints, or patterns in clothing should line up at seams or pockets. This might sound like a minor detail, but it’s extremely difficult to find lately…even in upscale brands. The pockets of the Vineyard Vines shorts with matching plaid squares might have taken a little bit more time to construct, carefully matching squares of fabric and stitching at just the right place; but these details reflect the true quality and craftsmanship of Vineyard Vines clothing. 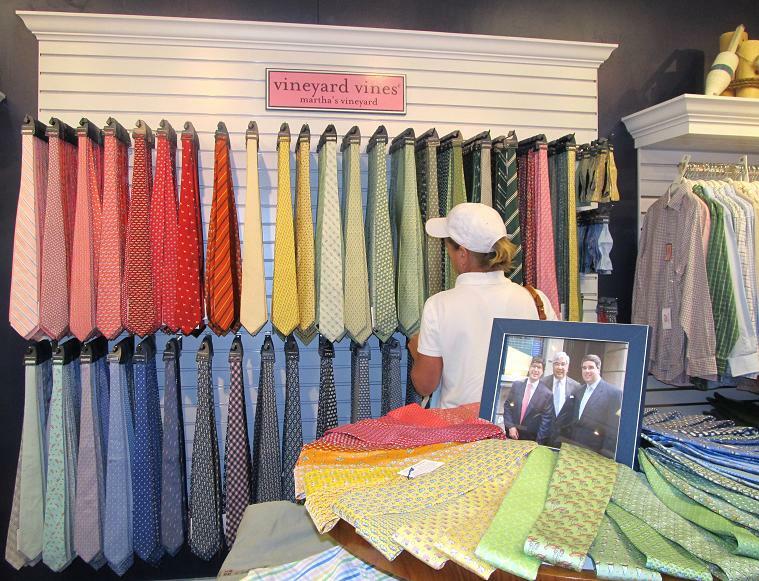 Ties were a hot seller at Vineyard Vines on opening day. My friend Caitlin says that the day before Father’s Day at a tie store is like Black Friday at any other store. There are a myriad of ties at the outlet store and prices are excellent! 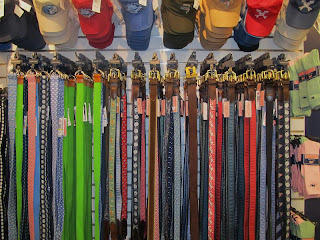 Other popular choices for men are belts and hats. 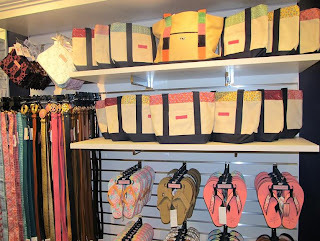 Belts, flip flops, and other accessories for women are also available. Again, I spotted many current season accessories in the store, with prices about 40-50% off retail. 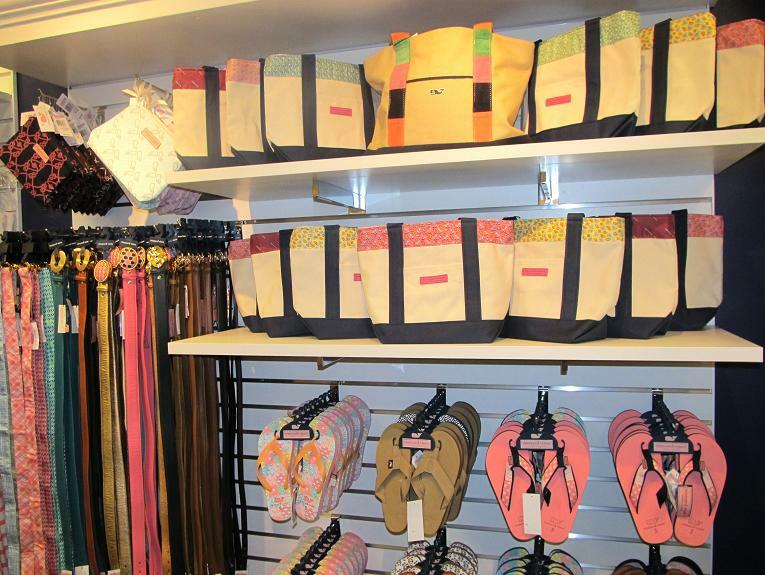 There is a large selection of tote bags in several sizes in addition to larger overnight bags. The selection for children was excellent and I was thrilled at the special promotion at the outlet. All girls items are buy 2 get 1 free. Some of my favorites were the little patch skort and ribbon dress. The computer system had some opening day glitches and all credit card orders had to be processed by hand. It was a large line by the time I got in line to pay, but everyone was very understanding and patient. No one really complained at all…we were all thrilled to be at the store that computer problems didn’t matter. Natalia was thrilled to add another whale sticker to her collection and remarked that it can go on her binder for 5th grade! 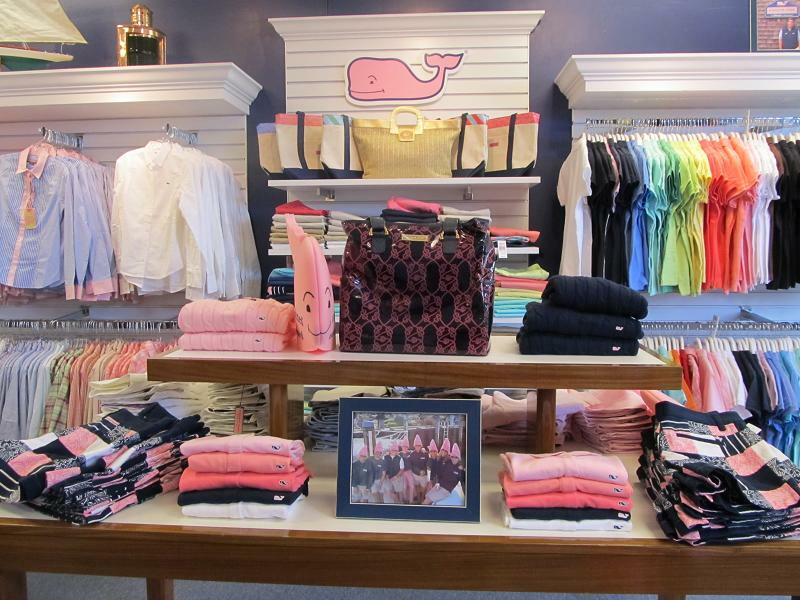 If you’re in the DC area, I highly recommend a stop at the Vineyard Vines outlet. It’s well worth the trip. The Vineyard Vines Outlet is in Leesburg Corner in Leesburg, Virginia. The Vineyard Vines outlet is located close to Old Navy. You have several options for parking. I would park by Williams Sonoma and walk up the row of stores. Alternatively, you can park on the side lot and enter the shopping center close to Old Navy. What is your favorite Vineyard Vines item? PS Be sure to check out my fabulous Vineyard Vines Christmas Ornament giveaway here! There are lots of ways to enter to win. Good luck! This outlet used to be near me in FL but they recently closed it and opened it up there :( Terribly sad. So updates on the good stuff would be nice so then I can call. I already scored on a bunch of stuff before they moved. I love how in America a sale is a true sale! We dont really have outlets here and any I have seen are just full of the junk that wouldnt sell in the regular store. A VV outlet?!?!!? this may be the best news I've heard all day! I love the totes, they're so dependable. I NEED to check this out now! How in the WORLD did I not know this was happening?!?! I must get there ASAP. Was the selection good? The selection was great! There were multiple size runs of most items except for a few things from fall in the back of the store. Wow, I am thoroughly impressed with the VV outlet! Usually companies churn out lesser-quality, outlet-specific lines that are disappointing in comparison to their original lines. But it seems like the VV outlet actually stays consistent! Man oh man do I want to pay a visit to the DC area now! Ooooh, I'll have to check this out--I'm not too far from Leesburg! Thanks for doing spreading the word about the store. If I make it up to see my aunt & uncle I will have to talk my aunt into going. My grandmother has always said the same thing about seems matching up and I have watched her many times put an item back because they do not match up. The Orlando VV outlet was very disappointing when I was there in April. Sounds like this new one is much better! Up through last summer I used to find great VV buys at Filene's Basement around here, but since the chain was purchased by Syms the store has gone downhill. I can't wait to check this out! I love VV and I have a post coming up on how to save there! Do you know if their outlet honors the student and teacher discounts? Student and teacher discounts??? I never knew about those! I do know that J. Crew honors the student/teacher discount at their outlet stores. I'll investigate the next time I go to VV. Just so you know, I went on a trip to the VV outlet this weekend and found a wonderful Shep Shirt that I've been lusting after for some time! I asked about the student and teacher discounts...they are not applied at the outlet stores. However, if you show your student or teacher ID at any regular VV store, you get 15% off!